I've complained already about the recent output from Comme des Garçons — they've become a kind of go-to house for variations, sometimes minor variations, on wood and/or incense.1 Mind you, they know how to do wood and/or incense, and in all truth, when they do break out of that rut, I don't always like the result.2 So I have mixed feelings about their most recent launch, Scent Three: Sugi. It's their third fragrance in collaboration with Monocle magazine (see Scent One: Hinoki and Scent Two: Laurel), and like the others, was developed by perfumer Antoine Maisondieu. And I do love it. It's beautifully done, and I'd very much like to have a bottle — please, Santa, send the other two Monocle fragrances while you're at it! — but unless you have the sort of never-ending interest in woody fragrances (and Comme des Garçons) that I do, you might not find it an absolute must-try. Sugi – also known as Japanese cedar – is popular as an ornamental plant in Japan and has a delicate, clean and energising fragrance...It’s a refreshing unisex scent that’s light but sophisticated, beginning with top notes of Mediterranean cypress and pepper from Madagascar, followed by iris from Florence and cedar from Virginia, and finished with pine and Haitian vetiver. That's just what Scent Three: Sugi is, a refreshing unisex scent. The opening, admittedly, is a bit rough — camphor! — but that doesn't last for more than a few minutes, and after that, it's a bright woody fragrance, fresh and sporty in the old fashioned sense: lively, no skank to speak of, but no synthetic fresh notes either. There is plenty of pine, cedar and cypress, but it's far milder than that makes it sound, and the iris smooths everything over without adding more than a gentle dusting of powder. Light, sophisticated, delicate, clean, energizing...yep, exactly. Verdict: I already gave it away in the opening — I love it. It's relatively quiet once it calms on skin, but it's one of those scents that catches you unaware during the middle of the day when you've forgotten you're wearing fragrance, and suddenly realize that something smells great. Still, if you're looking for a big statement fragrance, Scent 3 will not suit. It holds up well enough in the cold, though, and I would think it would also be a perfect alternative to a citrus cologne in hot weather. If I had to rank the three Monocle scents, I'd probably pick Hinoki first, then Laurel, then this one, but I'd rather just have all three and not have to worry about which is best. And the bottle is fabulous. Here's hoping Monocle keeps at it, and sticks with Antoine Maisondieu. 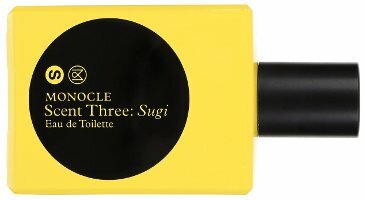 Comme des Garçons + Monocle Scent Three: Sugi is available in 50 ml Eau de Toilette, $120. For buying information, see the listing for Comme des Garçons under Perfume Houses. 1. Their wood and/or incense output over the past four years: Wonderwood (2010), Black Play (2012), Black Comme des Garçons (2013), Blue Invasion Blue Encens, Blue Cedrat & Blue Santal (2013). 2. Notably, Amazingreen (2012), which I thought I'd love, and A New Perfume (2011), or whatever it's really called. A New Perfume was at least satisfyingly weird. And I hated Comme des Garçons + Undercover Holygrace & Holygrapie (2010). p.s. Wow, super interesting reviews this week! Well, to me that is a camphoraceous note that probably comes from the pine — could that be it? There is something similar in the opening to Hinoki, but stronger — that one is advertised as having a turpentine note. It has pine too though. But it could be something else, I am not an expert on fragrance notes by any means. At any rate, it probably lingers on paper but I found it short lived on skin. Thank you, Robin! It must be camphor then (and I may have hard time mapping it as I associate camphor too strongly with mothballs). I do have a sample of Hinoki so I checked on it again, but no trace of it at all (and I do smell turpentine for sure). I also went to compare Hinoki to some Japanese incense that I have at home, and there it was — going strong. In Sugi, as you said, it was only in the very beginning and then gone (I really liked how Sugi smelled after five minutes or so). When I asked Japanese people about it in reference to incense, they dismissed it saying (understandably!) that it only smells fresh and nice. So, it must be me but I find it curious. Thanks again! Well, interesting…I do have some Hinoki incense and I don’t really smell it there. We need Kevin to weigh in here, he knows more about Japanese incense than I do. R: unfortunately, I’ve not smelled Sugi yet…but our Christmas wish lists are identical! HA! Well, I kind of meant more to weigh in on what might smell “skanky” in Japanese incense….see the 1st comment. R: since I find nothing “skanky” in Japanese incense (as a whole), I’m guessing the ingredient might be the cypress or cedar (notes some people find “sweaty”). Camphor is present…but to me that’s bracing and clean-medicinal. Who knows?! Thank you Kevin and Robin! I’ll try to educate myself on cypress and japanese cedar (as opposed to just cedar). Maybe, as Kevin has pointed out, the note is more sweaty than skanky … from now on, I’ll then call it just pleasantly stinky. A curious thing is that I noticed this note only in incense that I encountered in Japan (as opposed to Japanese incense bought elsewhere), and that other non-Japanese people find it somewhat “surprising” (it is not only me, I promise:). Not really relevant, but: this morning on the NYC subway I spied a stylish young woman carrying a small shopping bag that read “The Monocle Shop.” I thought, wow, a store just for monocles, in 2013?! only in New York! — and then I remembered this brand. Well wait a minute, I thought it was a magazine, not a shop? But admit I have never really investigated. You would think after 3 fragrances, I’d have looked into the actual magazine, but no. So now I did, and yes, it’s a store too! This sounds lovely – I’ve just ordered a sample and am very much looking forward to trying it. And I agree, the bottle looks perfect. Hope you will like it — do report back! This sounds very much not-my-thing… but I did have a question regarding the “fabulous bottle” reference. Is it just super-nice in the hand? I haven’t seen any of these in the, er, glass, just pictures, and they seem rather plain. Though I do understand the appeal of simplicity. I have never held one! I am reacting to the nice label design & the opaque yellow. I do get tired of clear glass. I saw the bottle in person, and IMO it is really nice in every respect (shape, size, color, weight, label and font). Could one be anosmic to something in Laurel and Hinoki? Well, sure, you could be anosmic to something. Hinoki in particular is not a light scent. I loved Hinoki and Laurel and will certainly track this one down too, but I do find that I tire easily of them… they give, give and give yet more! As a result both Hinoki and Laurel, while still in my collection, only get a few outings. Getting older, I think I am more appreciative of the Ellena/Giacobetti aesthetic of perfumery! The “Patron Saint of First Class Lounges” is excellent, thank you! And thanks also — makes me feel better to hear you don’t reach for them, since I can’t bring myself to spend the money to buy any of them. Ooh, as a rule, I’m not much of a fan of all things CdG or woody/incense-y, but I’m intrigued by this. I think the inclusion of iris and vetiver is making it sound quite appealing. I’ll have to investigate if I can try this somewhere since I don’t remember seeing any of the Monocle releases sold by the local CdG stockists. Slightly off topic, but have you tried the Marni Rose yet? No, and I want to…think it is only at Saks again, darn it. Ah, same here, looks like it’s Harrods only (not even Marni’s own website has it) and big sizes as well. Saks does have that small travel spray w/ the doll for $50. But not buying unsniffed! I have not tried any of the Monocle series…must rectify! As to Marni Rose…I will take a walk over to Saks to sniff. I was just there last week but did not think to stop by Marni. The beauty floor was redone and so I was a “little lost”. I also totally forgot that there is now a Le Labo outpost so I actually do not have to walk all the way to Barneys! Glad you reviewed this! I liked Laurel, but found it bit sharp, and it wore on me, as it did Santemon. This one sounds a bit softer, so I’ll try to sample it. The one I love is CdG 2 Woman. I have the limited edition fluffy white fur-covered, heart-shaped, half-ounce version, which is fun and was a bargain. I wish I had some Laurel on hand to compare, but I long ago used up what I had. I don’t find this one at all sharp though. CdG 2 Man is really interesting, too. CdG in those days really did advance the art of perfumery, as LT would say. So glad I saw this because I’m as enthusiastic about wood scents as Robin. I ordered samples of Hinoki and Sugi but haven’t come across Laurel yet. I am confident that I’ll like all three—even Laurel—because of years of smelling it and eucalyptus in Northern California. Thank you, Robin, for posting an enticing and informative review. The Laurel is milder than I expected, but I do love it — hope you’ll like Hinoki & Sugi!